Kankaria Lake was built by Sultan Qutab-ud-Din in the year 1451 A.D. It is basically an artificial multi sided lake with thirty four sides. With an approximate circumference of 1.4 miles (2.3 km), it represents the regale history of Ahmedabad. Lying on the south eastern side of the Ahmedabad city, the lake also has a fascinating island summer palace. The Mughal Emperor Jahangir along with his wife Empress Noor Jahan uses to visit this lake very often. 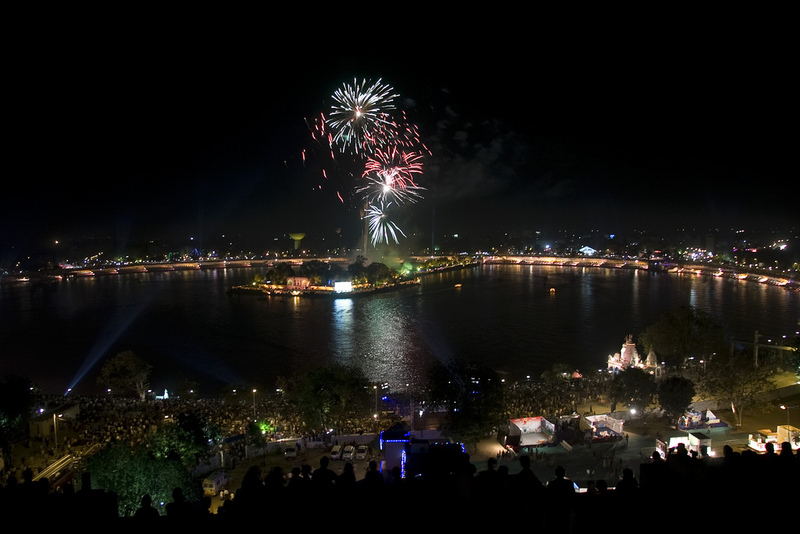 Kankaria Lake is one of the most favorite picnic spots of the people of Ahmedabad. Adjacent to the lake, lays a beautiful garden called Nagina Wadi. The pleasing view of the lake, the humming and chirping of birds and the greenery bordering the lake will make you fall in love with this place. You can also avail the boating facility. Kankaria Lake provides a beautiful view of the sunset. There is also a zoo and children's park located nearby the lake. In recent days with the development around the lake people can enjoy a toy train ride around the lake. 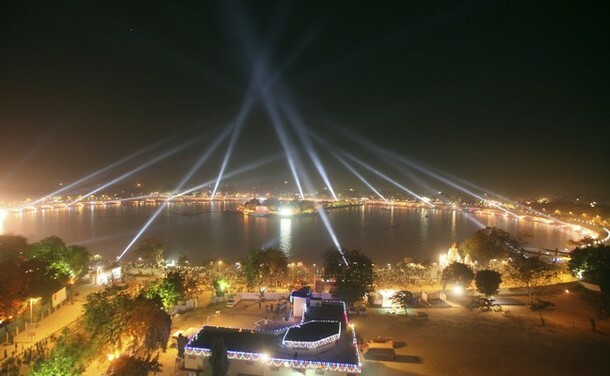 The inauguration ceremony for Rs 30 crore Kankaria lakefront was held on December 25, 2008. The central garden and the walkway has recently been revamped. 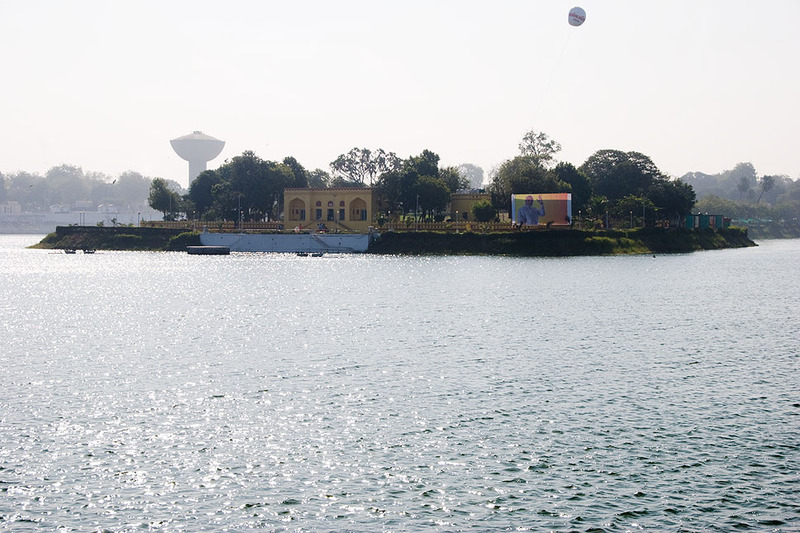 Upon completion of the renovation the lake was officially inaugurated in a week long event known as "Kankaria Carnival". It is the first of its kind in the history and is organised by Ahmedabad Municipal Corporation (AMC). A train named 'Atal Express'(Named after former prime-minister of India Mr. Atal Bihari Vajpayee on his birthday 25 December 2008) is being imported from London, the train will circle the lake on a 4.5 km track at a speed of 10 km/h. The train will have the capacity to carry 150 passengers, including 36 adults. The train is manufactured by Severn Lamb. Kankaria is the biggest lake in the city of Ahmedabad. It was built by sultan Ahmed Shah. Present Honorable Chief Minister of Gujarat Shri Narendra Modi has begun new development of the area. 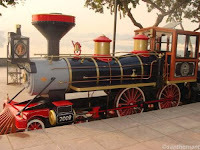 The road on the periphery of the Lake is being reconstructed as a pedestrian zone, and a toy train named the 'Atal Express' will circle the lake. The place is enjoyed as a place for yoga, walking, and running, especially in the very early morning. There are also other attractions like a zoo, Nagina Wadi, Balvatika, an aquarium and gardens. Kankaria Zoo has also records in breeding of rare species in Zoo which make them to feel that they are attached with nature and not cages. Tourists/visitors will remember this place for years together. How to reach Kankaria Lake?? People from Ahmedabad either by travelling in AMTS or Ahmedabad BRTS. The AMTS service Buses ranging from Lal Darwaza and overall Ahmedabad city or buses number is 32, 42, 60, and 152. That BRTS buses are becomes best supply to tug the individuals from Subhaj bridge, Chandkheda, Satellite and Vadaj Bus-stand. BRTS buses have stand on the gate of Kankaria Lake. The closest Bus Stand is Gita-mandir and distance is five km also near Kalupur railway station is 8 km. The people coming from outside cities with car can follow route with guidance hoardings in the city. You can also hire a Private Taxi or Cab. This is the most convenient way. You can see the photos of beautiful Kankaria Lake and its view during Kankaria Carnival ia awesome. Kankaria is the must visit place in Ahmedabad’s visit. So when are you visiting Kankaria....? ?